Summer has definitely arrived in New Jersey, and I've been reminiscing about my own childhood summer days. There was the town camp one year, with the unforgettable taste of orange drink, and the constant sound of nok-hockey. There were long bike rides to the reservoir. There was summer reading club at the library. And sometimes, there was the beach. My parents were both teachers, and because they had summers "off," we would usually take a day trip to the beach at least three or four times per season. My father, who loved the beach, would start to pack the car at dawn with two raucous plaid lawn chairs and a chaise lounge strung with orange plastic tubing (why we needed three chairs for two adults, I will never know), our carpet-like beach blanket, his blue and red Martini and Rossi umbrella (which could be seen from a mile down the beach if you happened to have taken a walk and lost your way in the sea of bodies and towels), the oversized cooler (always filled with 7-Up we weren't allowed to have, tortilla española, fruit), and too many plastic beach toys. When we got there, he'd head down to the water, get out beyond the breakers, and float on his back, dark sunglasses still on his face. My mother used to say she worried that some day he'd float out to sea; I thought that was sort of his intention, at least for a little while. As a child, I never liked the beach much, which is apparently abnormal for someone who grew up in a state where "down'a'shoah" (down the shore) is a single word in the vernacular. Though I liked building sand castles as much as most kids, I also have vivid memories of sand getting stuck in sensitive places in my overly frilly bathing suits, sand that burned my feet as we carried the mountain of beach gear for what seemed like miles to the water, vicious waves that sucked at my knees (I never could swim very well, and contented myself with standing in chest-deep water, pushing off as the waves came barreling in towards the shore). I preferred the rocky, sometimes-cloudy coastline of Maine, where my grandmother lived, and where I could clamber over the jettys, searching for shells and seaweed. One thing about the Jersey shore I did love, though, was the food. Something about the salt in the air made everything taste better. I often lobbied to go to Point Pleasant instead of Sandy Hook just so we could go to the Lobster Shanty on the way home, where they had a salad and hot food bar with strange and wondrous things like hush puppies and shrimp cocktail, and New England clam chowder that I'd order even on the hottest days. Though we were never allowed to eat boardwalk food, my mother would reminisce about the orange-vanilla custard (that's soft serve or "creamies" to you non-Jersey folk) at Kohr's on the boardwalk at Asbury Park, where she went to the beach with her mother for a week every summer. A foodie from a tender young age, I vowed to myself that as an adult, I'd come back and eat my way through the boardwalk, consuming as much custard and salt water taffy and lemonade as I could stand. The first time I had a creamsicle, I was in college, on the boardwalk with friends, tasting the forbidden fruit of my childhood. We stopped at Kohr's and I ordered an orange-vanilla twist. Maybe it was the salt in the air combined with the sweet of the custard, but it was like a revelation. It was like summer in my mouth. It almost made me love the Jersey shore. It's been a while since there have been cupcakes for your viewing pleasure, and since my new business card claims that I am a "cupcakepreneur" (yes, I totally made that up and I'm sure it's grammatically incorrect), I thought I'd post one. 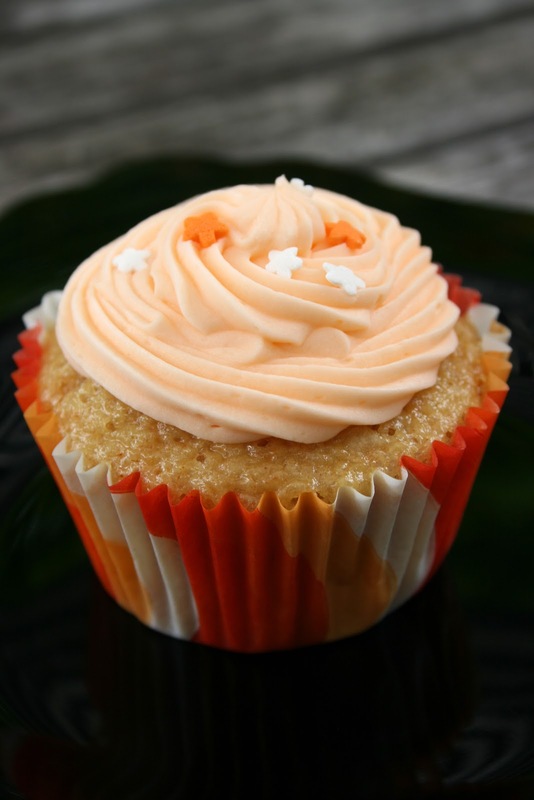 I've been wanting to create a creamsicle cupcake for a while, and this was just about perfect. It reminded me of everything I love about the Jersey shore, without the sand in my bathing suit. 1 T. + 1 t. finely grated orange zest. Measure the flour into a small bowl. In a large bowl combine the oil, sugar, soy milk, orange juice, and vanilla and orange or lemon extracts. To that mixture add 1 T. of flour and mix until combined. This will help emulsify the mixture. Sift together the remaining flour, baking powder, baking soda, and salt. Add the dry ingredients to the wet in three batches, mixing well after each addition until smooth. Fold in the orange zest and mix to distribute. Fill each cupcake liner 2/3 to3/4 of the way full. Bake for 20-22 minutes at 350F. The tops should spring back when touched, and a toothpick come out clean when inserted into the center of a cupcake. Remove from the muffin tin and cool completely on a baking rack before frosting. In a small bowl combine the cream cheese and butter until well combined. Add the confectioners sugar in about 1/2 cup additions. After each addition of sugar, add a splash of orange juice and beat well on medium speed. Add the vanilla and orange extracts and orange zest, and beat for another 3-5 minutes until the frosting is smooth, creamy and fluffy. Add red and yellow food color to achieve your desired color. Frost cupcakes, and sprinkle ever so lightly with sea salt; if you're feeling young at heart, with sprinkles, too. What does it for me is the SMELL. There's nothing like it. The wood of the boardwalk and fried food and sugared candy and taffy and the sea. There is no smell like it, period. Yum. I will have to check this out. My mom grew up in Jersey...we spent some time at Asbury Park as kids. You are bringing back memories for me. I lived in NJ from 1st-3rd grades and I can remember going to Asbury Park and Point Pleasant. I also remember the hot sand, vicious waves and sand in places it shouldn't be. I'm not a huge beach person, either. Sand in the bathing suit is the worst! My summer memories center around my best friend's pool, and being stuck inside because it was too hot to play outside. Beautiful looking cupcake. And I loved reading these reminiscences. Funny, I was exactly the same about sand. Especially on my feet when I then (the horror!) had to put shoes on for the trek back to the car. I always preferred rocky coastlines to sandy ones, though I've slowly learned to appreciate Atlantic beaches. But, yes, about the food. Hush Puppies. I looooved hush puppies, and only ever got to eat them when my family would go to the beach. Oh how I love creamsicles! We called them 50/50s, they had vanilla icecream on the inside with a shell of orange popsicle on the outside. They were SO GOOD! I also loved the beach, though sand annoyed me if I wasn't playing in the water. I hated having to get the sand out of everything when I got home. Sand is so corrosive. Do you bring your kids to the beach much? It's almost never warm enough to go here, and even if it is, the water is freezing no matter the season. We can only swim in the waves if we head down south to LA or San Diego, which we can't afford to do very often. I hope my kids love the beach, it's one of my favorite places in the world. But that is probably because I very rarely get to go. What a great post! I love the imagery and everything you shared about your childhood summer memories. I LOVE hush puppies, boardwalk fries and salt water taffy. My maternal grandparents always lived near the ocean when I was growing up. When I was too young to remember we took annual vacations with them to Ocean City, Maryland and eventually they retired to Hilton Head Island, SC where so many of my favorites childhood memories were formed. I loved building sand castles (especially drip ones and still do w/ my kids now), jumping and riding the waves in the ocean, walking the beach and later after I learned to run, I often do that now. I have always loved to spend time in the water in the summertime, whether it is a pool, lake or ocean. I love to ride bikes, play frisbee, go camping (though I haven't been in years), have campfires, make smores, sing camp songs, tell stories, etc. I was also a camper and then camp counselor (both day and residential) for many years, so many of my summer memories are camp related. I wrote a paper in college about how I thought the world would be a happier place if everyone was required to go to camp for at least two week a year! Wow, what a nostalgic post and comment this ending up being for me! Thank you! I was the kid with the chocolate allergy, so creamsicles were my absolute favorite - these look delicious and I may need some for my birthday! Ahhh...so many memories. Thanks for bringing me back to my childhood. I ate my way through the boardwalk last year with my very pregnant best friend. It was awesome! I am going to have to make them when I get home. Creamsicle is my Hubby's favorite! Can’t wait to make these for my husband. He loves creamsicle anything!